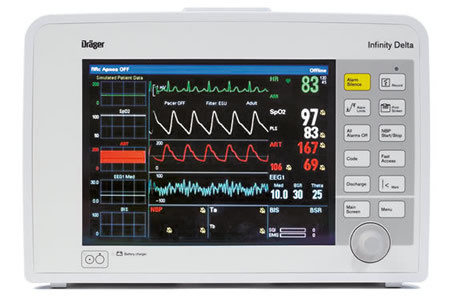 The U.S. Department of Homeland Security Industrial Control Systems Cyber Emergency Team (US-CERT) has issued an advisory about three vulnerabilities affecting Dräger Infinity Delta patient monitoring devices. The flaws affect all versions of Infinity Delta, Delta XL, Kappa, and infinity Explorer C700 patient monitoring devices. The flaws could lead to the disclosure of sensitive information stored in device logs, be leveraged to conduct Denial of Service (DoS) attacks, or could potentially allow an attacker to gain full control of the operating system of a vulnerable device. The flaws were discovered by Marc Ruef and Rocco Gagliardi of scip AG. Log files are not appropriately secured and are accessible over an unauthenticated network. An attacker could gain access to device log files and view sensitive information relating to the internals of the monitor, location of the device, and its wired network configuration. The flaw has been assigned a CVSS v3 base score of 4.3. An error in the way input is validated could be exploited to cause the device to constantly reboot. An attacker could repeatedly send a malformed network packet causing a vulnerable device to repeatedly reboot until it reverts to its default configuration and network connectivity is lost. The vulnerability has been assigned a CVSS v3 base score of 6.5. An attacker could break out of kiosk mode via a specific dialog and gain access to the underlying operating system and take full control of the operating system. The vulnerability has been assigned a CVSS v3 base score of 8.4. All three vulnerabilities were addressed by Dräger in December 2018. Users should update the devices to Delta/Infinity Explorer VF10.1 which can be accessed on Dräger ServiceConnect. Users have also been advised to review their network segmentation configuration and ensure that the devices are logically or physically separated from the hospital LAN and also check the Windows patch level of their Infinity Explorer.